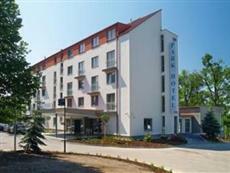 Discover all that Hluboka Nad Vltavou has to offer with Parkhotel Hluboka Nad Vltavou as a base. All hotel's guestrooms have all the conveniences expected in a hotel in its class to suit guests' utmost comforts. In-room facilities include non smoking rooms, daily newspaper, desk, hair dryer, in room safe, television, bathtub. This Hluboka Nad Vltavou accommodation features on-site facilities such as 24hr room service, shops, executive floor, elevator, bar/pub, laundry service/dry cleaning. In addition, the hotel's guests can enjoy the leisure and sports facilities provided on the premises: massage, jacuzzi, golf course (on site), gym, sauna, tennis courts. Being one of the good quality hotels in Hluboka Nad Vltavou, guests staying at this hotel will find its convenient location and tranquil atmosphere pleasurable. For your reservation at the Parkhotel Hluboka Nad Vltavou Hluboka Nad Vltavou, please choose your period of stay and fill out our secure online booking form.